It is a dialogue mechanism that would include defence and foreign ministers of the two countries. It is similar to India-Japan 2+2 dialogue format between foreign and defence secretaries and ministers of the two countries. It replaces earlier India -Japan 2+2 dialogue format between foreign and defence secretaries and ministers of the two countries. It replaces earlier India-US Strategic and Commercial Dialogue. Three factors have contributed to the emerging strategic convergence. With the opening of the Indian economy, the American private sector began to look at India with greater interest. U.S. foreign direct investment in India is more than $20 billion, Indian companies too have invested $15 billion in the U.S., reflecting a sustained mutual interest. The political coming of age of the three-million-strong Indian diaspora. Its influence can be seen in the bipartisan composition of the India Caucus in the U.S. Congress and the Senate Friends of India group. The US wants to team up with India to contain China’s ambitions in the Indo-Pacific region. However, engagement of India-US has not been smooth sailing. The U.S. is used to dealing with allies, invariably junior partners in a U.S.-dominated alliance structure and adversaries. India is neither, and is also determined to safeguard its strategic autonomy. Developing a habit of talking to each other as equal partners has been a learning experience for India and the U.S.
Indians become cautious of the U.S.’s attempts to drive unequal bargains and Americans find the Indian approach rigid and sanctimonious. Despite this, significant progress has been registered over the years resulting in the 60-plus bilateral dialogues, to which the 2+2 is now being added. Two parallel tracks of dialogue began in the 1990s. The strategic dialogue covering nuclear issues shifted gears following the nuclear tests of 1998 and imposition of sanctions by the U.S.
India-U.S. concluded a bilateral civil nuclear cooperation agreement in 2008. The defence dialogue began in 1995 with the setting up of the Defence Policy Group at the level of the Defence Secretary and his Pentagon counterpart and three Steering Groups to develop exchanges between the Services. A decade later, this was formalised and enlarged into the India-U.S. Defence Framework Agreement which was renewed for 10 years in 2015. Today, the U.S. is the country with which India undertakes the largest number of military exercises which have gradually evolved in scale and complexity. During the Cold War, more than three-fourths of India’s defence equipment was of Soviet origin. This gradually began to change, and in recent years, the U.S. and Israel emerged as major suppliers. The Indian Air Force went in for C-130J Hercules and the C-17 Globemaster aircraft, along with Apache attack helicopters and Chinook heavy lift helicopters. The Indian Navy acquired a troop carrier ship and the P-8I long-range maritime reconnaissance aircraft. An agreement for 24 multi-role helicopters for the Indian Navy is expected soon. The Indian Army went in for the M-777 howitzers and artillery radars. From a total of less than $400 million of defence acquisitions during 1947-2005, the U.S. has signed defence contracts of over $15 billion since. Pathfinder projects have been identified under this Defence Technology and Trade Initiative (DTII). To get around export control licensing and other bureaucratic hurdles, an India Rapid Reaction Cell in the Pentagon was set up. In 2016, India was designated as a ‘Major Defence Partner’ country. Another step forward in the middle of this year was the inclusion of India in the Strategic Trade Authorisation-1 (STA-1) category, putting it on a par with allies in terms of technology access. This should enable the DTII to graduate to more ambitious projects. Acquiring U.S. high technology comes with its own set of obligations in terms of ensuring its security. These take the form of various undertakings often described as foundational agreements. The first of these was GSOMIA (General Security of Military Information Agreement) which India signed in 2002. The U.S. proposed its standard logistics support agreement text in 2003 which was finally concluded in 2016, after it was made into an India-specific text.It facilitates logistics supplies during port visits and joint exercises and does not contain any obligations for joint activity or any basing arrangements. Realising Indian reservations, the U.S. was more flexible, and now the India-specific Communications Compatibility and Security Agreement (COMCASA) is likely to be signed. It makes it possible to install high-end secure communication equipment on U.S. platforms that we have been acquiring. With the possibility of acquiring armed Sea Guardian drones, COMCASA was necessary to ensure optimal use. What opportunities does 2+2 dialogue offer? India’s proposed purchase of the S-400 missile defence system would attract CAATSA sanctions. Countering America’s Adversaries Through Sanctions Act (CAATSA) enacted last year which enables the U.S. government to sanction countries that engage in ‘significant transactions’ with Russian military and intelligence entities. A waiver provision has now been introduced to cover India, Indonesia and Vietnam. It requires certification by the U.S. that the country concerned is gradually reducing its dependency on Russian equipment and cooperating with the U.S. on critical security issues. Indian concerns on this need to be addressed. The U.S. sanctions on Iran after its unilateral withdrawal from the nuclear deal is another concern that needs to be addressed. Iranian crude imports have grown significantly in recent years and India also stepped up its involvement in developing Chabahar port. The port provides connectivity to Afghanistan and Central Asia. The Iran Freedom and Counter-Proliferation Act (2012) contains a waiver provision in case of activities for reconstruction assistance and economic development for Afghanistan, which is a U.S. priority too. Creative thinking will be needed in the 2+2 dialogue to overcome these challenges. It should be ensured that there are no nasty surprises and difficult issues are settled through quiet diplomacy. In order to realise the Joint Strategic Vision for the Asia-Pacific and Indian Ocean Region (2015), and contain China’s growing dominance in the region, both countries will have to nurture the habit of talking and working together. Emphasis is laid upon the need for sustainable development of Islands with people’s participation. Development of 220 rooms Premium Island Resort in 42 hectares land at Long Island, 50 beach tents in 2.75 hectares land at Aves Island, 70 premium tents & tree houses in 25 hectares land at Smith Island and 120 rooms premium beach resort in 9.75 hectares land at Bharatpur, Neil Island. Setting up of infrastructure for power, water, floating jetty, adventure sports, banqueting and conferences. Air strips, jetty, helipads, Roll On/Roll Off (RORO) ferry and roads works. It provides economic and livelihood opportunities. How would the ecological and cultural sensitivity be ensured? Does a capacity really exist to ensure the safeguards when the scale and the ambition is so large? How much will it really benefit the local people and the local economy? An island set-up that is promising everything from air strips and floating jetties to premium resorts, not to mention ecological sensitivity, global bench marking and overall socio-economic development, is unable to ensure that the local community has a safe and reliable ship to travel on, in an island system where shipping is the lifeline. If such a basic and critical element cannot be ensured, what is the guarantee that the grand plans and promises will not meet the same fate? What is required is addressing key issues and that involves providing transport facility to people of this region. With earlier cases of disaster the imperative part on the government would be to provide basic infrastructural development that means providing safe and effective means of travelling which is the lifeline of the local community so that any disaster due to ships are avoided. It is argued that along with colonial laws like criminal defamation, laws on obscenity and blasphemy, the sedition law also runs against the ideal of Freedom of Expression, guaranteed under Article 19 (1) (a) of the Indian constitution. There have been repeated instances of its misuse. Regimes at the Centre and the States have often been shown in poor light after they invoked the section against activists, detractors, writers and even cartoonists. Despite all this, Section 124-A has survived all attempts by successive generations to reconsider it, if not repeal it altogether. How far is it justified for India to retain an offence introduced by the British to suppress the freedom struggle, when Britain itself abolished it 10 years ago? The Law Commission, for the third time in five decades, is now in the process of revisiting the section. The consultation paper calls for a thorough reconsideration and presents the various issues related to it before the public for a national debate. In an earlier report in 1968, the Law Commission had rejected the idea of repealing the section. In 1971, the panel wanted the scope of the section to be expanded to cover the Constitution, the legislature and the judiciary, in addition to the government to be established by law, as institutions against which ‘disaffection’ should not be tolerated. The only dilution it mooted was to modify the wide gap between the two jail terms prescribed in the section (either three years or life) and fix the maximum sanction at seven years’ rigorous imprisonment with fine. What are the objections to the provision? Its definition remains too wide. ‘Overbroad’ definitions typically cover both what is harmless and what is offensive. The core principle enunciated by the Supreme Court — that the incitement to violence or tendency to create public disorder are the essential ingredients of the offence — has been forgotten. As long as sedition is seen as a reasonable restriction on free speech on the ground of preserving public order, it will be difficult to contain its mischief. Currently the section is slapped against any discording entity, without any fairness. It is this grey area, which needs to be corrected. The government has to follow the Supreme Court order that “the incitement to violence or tendency to create public disorder are the essential ingredients of the offence has been forgotten” in letter and spirit. It can be amended so that there is a much narrower definition of what constitutes sedition, but the far better course is to do away with it altogether. The Uniform Civil Code (UCC) in India proposes to replace the personal laws based on the scriptures and customs of each major religious community in the country with a common set governing every citizen. The Law Commission of India on Friday said a Uniform Civil Code (UCC) is neither necessary nor desirable at this stage. The commission said secularism cannot contradict the plurality prevalent in the country. A unified nation does not necessarily need to have “uniformity.” Efforts have to be made to reconcile our diversity with universal and indisputable arguments on human rights, the commission said. Difference does not always imply discrimination in a robust democracy, the government’s topmost law advisory body said. The term ‘secularism’ has meaning only if it assures the expression of any form of difference. This diversity, both religious and regional, should not get subsumed under the louder voice of the majority, the commission said. At the same time, it said, discriminatory practices within a religion should not hide behind the cloak of that faith to gain legitimacy. 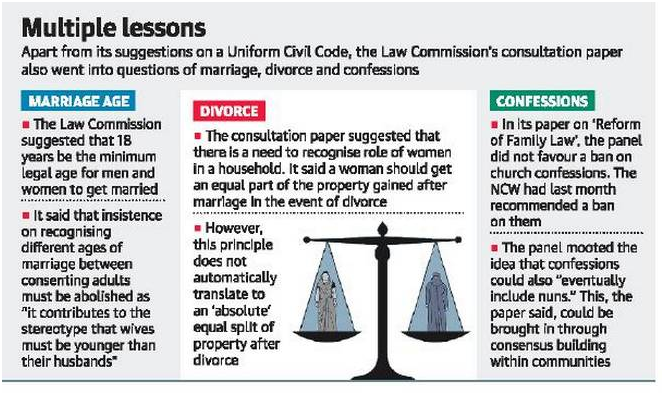 “By codification of different personal laws, one can arrive at certain universal principles that prioritise equity rather than imposition of a Uniform Code, which would discourage many from using the law altogether, given that matters of marriage and divorce can also be settled extra-judicially,” the commission reasoned. It suggested certain measures in marriage and divorce which should be uniformly accepted in the personal laws of all religions. These amendments in personal laws include fixing the marriageable age for boys and girls at 18 years so that they marry as equals, making adultery a ground for divorce for men and women and to simplify divorce procedure. The commission said the filing of Section 498A IPC (dowry harassment) cases is actually done by women wanting a quick exit from a difficult marriage. This is not recommended owing to merely a moral position on bigamy, or to glorify monogamy, but emanates from the fact that only a man is permitted multiple wives, which is unfair,” the commission explained. The BIMSTEC (Bay of Bengal Initiative for Multi-Sectoral Technical and Economic Cooperation) is a regional grouping comprising India, Bangladesh, Myanmar, Sri Lanka, Thailand, Bhutan and Nepal. The regional grouping’s Kathmandu Declaration focuses on backing of terror by state and non-state actors, apart from connectivity among the member nations. Describing terrorism as a “great threat” to international peace and security, India and six other BIMSTEC nations on called for identifying and holding accountable states and non-state entities that encourage, support or finance terrorism, provide sanctuaries to terrorists and falsely extol their virtues. The Kathmandu Declaration deplored terror attacks in all parts of the world, including in BIMSTEC countries, and stressed that there could be no justification for any act of terrorism. The declaration did not name any specific country, but Pakistan is often comes to light for providing safe havens to terrorists. The declaration underlined the importance of multidimensional connectivity, which promotes synergy among connectivity frameworks in the region, as a key enabler to economic integration for shared prosperity. The MoU signed provides for optimisation of using energy resources in the region & promotion of efficient & secure operation of power system. The decennial exercise will involve 25 lakh trained enumerators and the use of maps/geo-referencing at the time of house listing is also under consideration. The decision to count the OBCs in the next Census is to get a correct perspective on the social status in the country. The enumerators will start “house listing” in 2020 and the headcount will begin from February 2021. The 2011 caste data collected as part of the SECC is yet to be released by the Centre. The National Commission for Backward Classes says there are 2,479 entries on the Central list of the OBCs. The 2011 Census collected information in 29 categories that included a separate column for Scheduled Caste/Scheduled Tribes. The OBCs would be an option in the column in 2021. Presently, the “schedules” (a tabular form containing details of individuals), carried by enumerators to households was being stored in a physical form at government’s storehouse in Delhi. It is based on these schedules that the relevant statistical information on population, language, occupation, etc, are sorted from and published. The data collected during 2021 Census would be stored electronically, also a first. The Home Minister emphasized the need for improvement in the Civil Registration System. This was especially on registration of birth and death in remote areas, and strengthening sample registration system for estimating the data namely, infant mortality rate, maternal mortality ratio and fertility rates. Next postSaturday dose of motivation for better Monday!